Served on Erin's sourdough English muffins, these are soooo good! I've long made Sloppy Joe's In A Bowl – and these are a variation of that recipe. 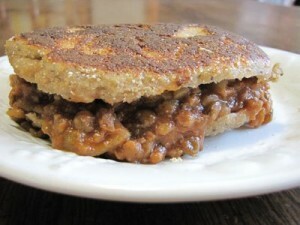 Often I stretch out the meat by adding cooked lentils to the Sloppy Joe mix. For these sandwiches, that variation is wonderful! Here's the recipe which includes extras of the seasonings to flavor the lentils, too. desired sandwich garnishes: sliced onions, sliced tomatoes, sliced cheese, sliced olives, etc. Start soaking 2 cups of dry lentils the night before in 4 cups of warm water, along with 2 tablespoons of acid such as whey, lemon juice, or raw apple cider vinegar. The next day, drain and rinse the lentils. Put the lentils and 4 cups of fresh water in a pot. Bring it to a boil, and let simmer until the lentils are tender, about a half hour (more at high elevations). Drain the lentils. Let cool, then store in the refrigerator until needed. Put the ground beef in a 4 to 6 quart stock pot. Over medium heat, brown the beef. Add onions and garlic. Saute until soft. In a 4 cup measuring cup, whisk together: water, tomato paste, sea salt, pepper, olive oil, and honey. Add sauce mixture to meat, along with cooked lentils. Cover and let simmer for 20 minutes. Adjust seasonings to taste. Turn off heat. Scoop onto bread of choice (might I again recommend Erin's wonderful sourdough English muffins? ), along with garnishes and serve. Enjoy! This is part of the Sandwich Round-Up – click over to see other yummy sandwich ideas, from me and others. Feel free to link up your own sandwich ideas – either from an old or new post, or share in the comments. I make sloppy joes about once every two years. No one will eat them but me. *sigh*. Your recipe looks yummy. Michelle – You’re so funny! 🙂 I think you should make Sloppy Joes just for yourself! Lisa – That’s a good question! This makes a big batch. I’d say it at least serves 10. When I make it we eat off it for at least a lunch and a dinner. My kids saw the picture and immediately began to remind me that we haven’t had Sloppy Joes in a LONG time. I love the idea of extending this with lentils. That’s one reason we don’t have them often – my crew can wipe out pounds of ground meat piled on a sandwich. Maybe we can have them more often, now. I guess I’ll go start some Sourdough English Muffins – we love those, too! Thanks, Wardee! .-= My Petite Chefs´s last blog post… Chocolate Coconut Oil Frosting =-. Connie – We are the same. Not that we wouldn’t love a big hunk of meat every night. 😀 The lentils are a great addition to stretch the meat, plus they have a nice meaty flavor when done right. Hope you like these! Jen – That’s funny! We’re all different. And that’s good! Great recipe. I added chopped carrots and celery with the onion and garlic. Adds more color and texture. Thanks for this recipe! I tried it for the first time last night and everyone loved it. I used to make a lentil sloppy joe recipe that my family wasn’t too keen on. I halved this since I was a little skeptical of them liking it. Next time I’ll make the full recipe! I also hadn’t made sloppy joes for a few years b/c I don’t like using that much beef in one recipe. How do you keep the lentils from having that overcooked taste? I’m not sure what you mean by “overcooked taste”.